The Georgia Restaurant Association (GRA) is proud to announce the finalists for the 2017 Georgia Restaurant Association Crystal of Excellence (GRACE) Awards where all finalists are peer nominated, which ensures that we honor the most deserving in our industry. 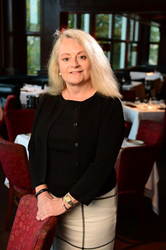 “The GRACE Awards Gala recognize hospitality and foodservice professionals for excellence and achievement"in their fields, ” said Karen Bremer, CEO of the Georgia Restaurant Association. The Georgia Restaurant Association (GRA) is proud to announce the finalists for the 2017 Georgia Restaurant Association Crystal of Excellence (GRACE) Awards. All finalists are peer nominated, which ensures that we honor the most deserving in our industry. The winners are then decided by the GRACE Academy, consisting of all former GRACE nominees and current GRA Board Members. On Sunday, October 29, 2017, the GRACE Awards Gala, an exclusive event honoring leaders who have made outstanding contributions to Georgia’s restaurant industry, will take place at the Stave Room at American Spirit Works in Atlanta, GA. At the event, winners for Restaurateur of the Year (Small/Independent, Franchisee, Large/Corporate), Industry Partner of the Year and the Distinguished Service Award will be announced. The GRA will also honor the Restaurant Employee of the Year, Manager of the Year, Culinary/Hospitality Student of the Year and this year’s Lifetime Achievement Award winner, John Ferrell of Mary Mac’s Tea Room. A complete list of finalists can be found at the end of this release. In addition, Jim Stacy, television host, will serve as the Master of Ceremonies. Live entertainment will be provided by the folk Americana group Little Country Giants. “The GRACE Awards Gala is a time to recognize hospitality and foodservice professionals for excellence and achievement in their fields, emphasizing the GRA’s mission to celebrate and honor Georgia’s exemplary culinary scene,” said Karen Bremer, CEO of the Georgia Restaurant Association. A portion of the proceeds from this event will go to benefit the Atlanta Community Food Bank, whose mission is to fight hunger by engaging, educating and empowering the community. To learn more about the GRACE Awards, or to purchase tickets, visit http://www.garestaurants.org/grace-awards-gala.html. The GRA’s mission is to serve as the voice for Georgia’s Restaurants in Advocacy, Education and Awareness. The GRA is sanctioned by the National Restaurant Association (NRA) to operate Georgia’s only not-for-profit representing the state’s foodservice industry. From large chains to start-ups, the GRA helps make Georgia a better place for restaurants to do business and helps make restaurants better for Georgia. The GRACE Awards is the Georgia Restaurant Association’s annual black-tie gala event honoring Georgia’s Restaurant Industry. The GRACE awards are peer-nominated and honor the top finalists in the following categories: Restaurateur of the Year (Small/Independent, Franchisee, Large/Corporate), Industry Partner of the Year and the Distinguished Service Award. The winners are announced at the event and are presented with crystal works of art created by renowned local artist Hans-Godo Frabel. For more information, ticket reservations, and/or sponsorship opportunities, visit the website at http://www.garestaurants.org/grace-awards-gala.html. For media inquiries, please contact Rachel Bell, director of marketing and communications, at (404) 467-9000..